The infographic below summarizes some of the key findings from the survey. 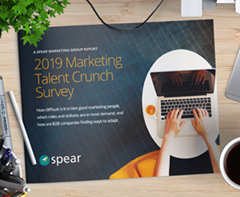 More complete results – along with expert analysis and strategies for success – are included in a comprehensive, 19-page “2019 Marketing Talent Crunch Survey Report,” available as a free download from the Spear Website. Click here to view infographic full size. This entry was posted in B2B Marketing, Marketing Agencies, Marketing Careers, Marketing Staffing and tagged hiring marketers, interim marketing help, marketing agencies, marketing consultants, marketing contractors, marketing hiring, marketing staff augmentation, marketing staffing, marketing talent, marketing talent crunch on January 24, 2019 by Howard Sewell.